and families on Yorkshire Day. 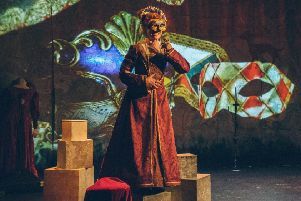 ‘The Best of All Possible Worlds’ takes place on a large tabletop stage, and has been created with a deaf and hearing-impaired audience in mind, as no words are used throughout. This captivating new show from eccentric performers the Whalley Range All Stars, features a witty and highly visual puppet theatre show. The three professional actors – who are all deaf or hearing-impaired – are prised out of their familiar comfort zone and face a pile-up of obstacles, barriers and misfortunes. They face an unpredictable and unfamiliar world as they embark on their escape and adventure. Sue Auty, co-artistic director of Whalley Range All Stars, said: “Our performers are deaf and hearing impaired and include Adam Bassett, who is a profoundly deaf actor and known from BSL Zone on TV. The show is presented by Creative Scene, which uses Arts Council, England funding to bring arts and culture to North Kirklees. It’s to be performed as part of Oakwell Hall’s Wacky Wednesdays, which takes place each week during August, to entertain children and families. August 1. Each show lasts for 30 minutes and is a ‘pay what you feel’ event. No booking is required, jsut turn up and register on the day.